Sun., March 15, 2009, 6 a.m. Asking for voters for more money in a recession is a difficult task. The government entities that made that request last week probably didn’t know how bad the economy was going to look by election day, so most of them had to be at least relieved with the result. Most, but not all. The City of Spokane’s request for an $18.5 million bond issue was pretty soundly thumped on Tuesday, while school districts were passing levies and the Spokane School District – which shares most of the same voters as the city – floated its bond. An outside observer might assume that the bigger of the two bond issues was the one that crashed and burned. Not so; the school bond issue, at $288 million, is about 15 times bigger. Both were going to raise property taxes, although the school district had the advantage of being most of the way there on the tax with its existing bond issue that passed in 2003. Although school issues generally get a very favorable reception by Spokane voters, the city was asking for its money for law enforcement, which generally has strong support, and an animal shelter. On most political scales, cops and stray pets may not come quite level with kids, but the trays would not tip too far apart. 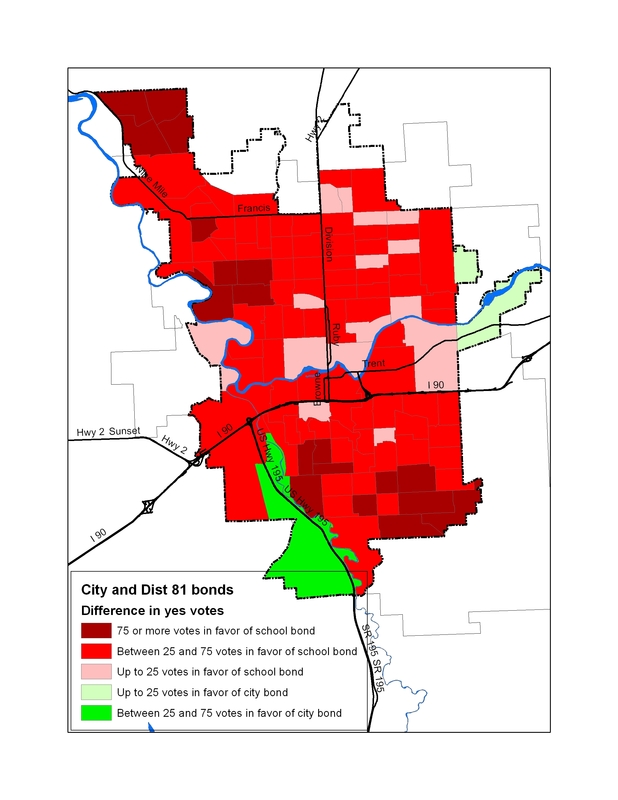 But the city’s bond issue ran significantly behind the school bond in all but three of the precincts the two jurisdictions share, a computer analysis of the vote totals shows. Worse, it got seriously hammered in some of the city’s heaviest voting precincts, running 75 votes or more behind the school bond in the Indian Trail precincts in the northwest tip of Spokane, the central South Hill precincts, and the southeast precincts between Lincoln Heights and Moran Prairie. It also did poorly, relative to the school bond, in West Central, East Central, downtown…to repeat, it got hammered. The only place where it did significantly better than the school bond was in the Latah Creek precincts. Accounting for the difference is probably not too difficult if one looks at the two campaigns. Citizens for Spokane Schools, which was pushing the District 81 levy and bond issue, had spent about $145,000 on its “vote yes for kids” campaign a week before the election, which is the most recent set of records available. Citizens for Public Safety, working on the city bond issue, had spent about $6,600. Beyond the sheer dollar volume, the content of the campaigns also gave the schools a huge leg up on getting those yes votes. They had familiar blue and white signs, a familiar slogan and a message of no tax increases. The fact that the proposed levies were, in fact, larger than current levies in some instances, and that the bonds were not, as signs and ads claimed, being “renewed” was reported before the election but didn’t seem to make a difference to voters – if they noticed it at all. The later ballot counts, which would have been marked and mailed after the factually challenged levy claims were reported, were slightly more favorable than the earliest ballot count. Another problem may have been that the city bond issue was for a fairly amorphous set of projects, such as an evidence warehouse, some new courtrooms, an expansion of an animal shelter. The District 81 bond issue was for specific schools, and the approval margin is significantly higher in the neighborhoods around those schools, presumably because parents who live there know what needs to be done to their kids’ classrooms. The other thing that supporters of the city bond issue never did use to their advantage was the aspect of most likely to draw an instinctive, and positive, reaction. That was the animal shelter portion of it. They talked about how prosecutors need to secure evidence better to convict bad guys, and cops need a better firing range. But a better place to keep Fluffy and Rover when they get out of the fenced yard was not as well known. Not quite, anyway. But come to think of it, that magazine sold pretty well. The Spokesman-Review's political team keeps a critical eye on local, state and national politics.